1999 Evinrude 2 stroke with fuel injection, Automatic Bilge Pump, Depthfinder, Compass, Bimini Top, Mooring Cover, Bow Cover, Front Dodger, Life Jackets, Side Curtain Windows, Full Canvas. Grady White Tarpon has all the qualities that Grady White is noted for. permits for a smooth and steady ride. The engine provides great economy (fuel injection) and superb power. There is an inboard ladder for easy access plus a reboarding ladder from the water. There is a 7 ft.
protection in inclement weather, all curtains just zip right in. There are 2 batteries with an on/off switch conveniently located. and teak wood cleaned and oiled yearly. A new 60 gallen Stainless Steel fuel tank was installed 2 years ago. 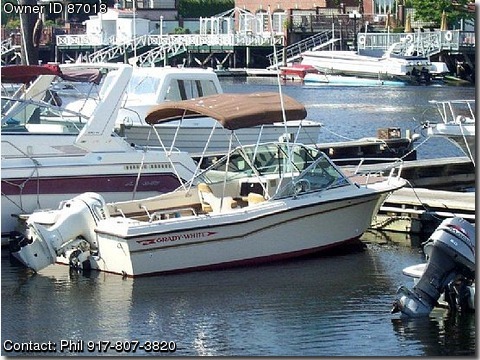 She rides and handles as good as she looks, This is a perfect boat for fun and fishing.